Oil on canvas, 25 x 20 in. James Cohan presents Lee Mullican: Cosmic Theater, curated by Michael Auping at the gallery’s Chelsea location. The exhibition Lee Mullican: Cosmic Theater explores the late artist’s sustained interest in the universe as source material for his creative voice. Lee Mullican was a seeker and tirelessly pursued a form of abstraction that connected nature and spirituality. Pulling from a wide range of influences he created works that found new meanings through formal explorations of composition, color, and mark making. In his conversation with Joanne Phillips from 1976, he recalled the push and pull between abstraction in the purest sense and what he explained as his “need for some kind of image.” Through a close examination of his paintings and drawings we begin to understand that these patterns, shapes, and figure-like forms reflect his deep and abiding interest in the cosmos. Lee Mullican’s enduring quest was to create through his art a new perspective. In his richly textured world, the bird’s eye and the mind’s eye are one, with outer space and inner space conflating and commingling on the striated surfaces of the picture plane. The paintings and drawings chosen for the exhibition, some being shown for the first time, map a revealing path through much of Lee Mullican’s career, ending with paintings from his last series, The Guardians. Bringing together work spanning fifty years, the exhibition surveys key themes running through the artist’s career, framing his unusual hybridization of symbolic figuration, abstracted landscapes, and abstract space with his long-time fascination with the sky and the galaxy beyond. The exhibition is accompanied by a full-color illustrated publication, featuring an essay by Michael Auping and published by Scheidegger & Spiess. LEE MULLICAN was born in Chickasha, Oklahoma in 1919 and died in Los Angeles in 1998. He attended the Kansas City Art Institute after transferring from the University of Oklahoma in 1941. Upon his graduation from the Institute in 1942, Lee Mullican was drafted into the army, serving for four years as a topographical draughtsman. Lee Mullican traveled to Hawaii, Guam and Japan before ending his tenure in the army in 1946, when he moved to San Francisco. After winning a prestigious Guggenheim Fellowship in 1959, he spent a year painting in Rome before returning to Los Angeles where he joined the teaching staff of the UCLA Art Department in 1961, keeping his position for nearly 30 years. He divided the later part of his life between his homes in Los Angeles and Taos, traveling internationally and co- organizing exhibitions at UCLA. 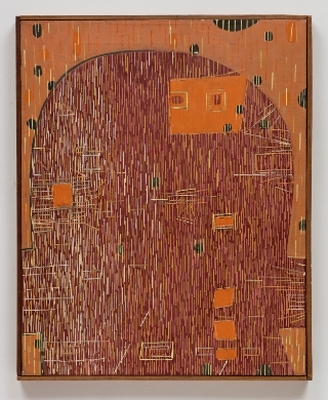 Lee Mullican’s works are included in the permanent collections of the San Francisco Museum of Modern Art, the Hammer Museum, the Whitney Museum of American Art, the Los Angeles County Museum of Art, and the Metropolitan Museum of Art, as well as in numerous other institutions. MICHAEL AUPING is an independent curator and writer based in California and Texas and a specialist in the international developments of Post War art. Over his 40 year career, he has organized numerous exhibitions that have focused on Abstract Expressionism and related movements. As Chief Curator of the Albright Knox Art Gallery, his 1987 exhibition Abstract Expressionism: The Critical Developments was considered the most thorough survey of that movement in over three decades, and the book of the same title redefined the movement from both new European and American perspectives. He also curated major surveys of the work of Clyfford Still and Arshile Gorky. As Chief Curator of the Modern Art Museum of Fort Worth, Auping organized Philip Guston: Retrospective. He has also organized exhibitions of the work of John Chamberlain, Susan Rothenberg and Richard Serra.